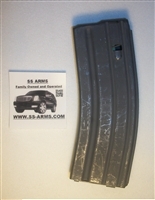 Aluminum 30 round Magazine .223 with Orange Follower With laser engraved Don’t Tread On Me on 1 side of the magazine. Aluminum 30 round Magazine .223 with Orange Follower With laser engraved Tactical Flag on 1 side of the magazine. Aluminum 30 round Magazine .223 with Orange Follower With laser engraved ”SPARTAN MOLON LABE” on 1 side of the magazine. Aluminum 30 round Magazine .223 with Orange Follower With laser engraved Punisher Logo on 1 side of the magazine.